In the picturesque beachside town of Brunswick Heads just a short 25 minute drive from our Cabarita Beach resort, you can enjoy the relaxed markets that the first Saturday of every month. Invite friends and family to enjoy an exciting Saturday morning at the The Brunswick Heads Markets offering fun artisan stalls selling everything you could expect at a popular local market. Leave with something interesting from a huge selection of market stalls selling clothing, plants, arts and crafts, souvenirs, food, beverages, and lots more for an unbelievable price. You will surely leave with a few bargains! The Brunswick Heads Markets enjoy a mixture of local and imported goods and produce, that you can try whilst there or take home fresh! 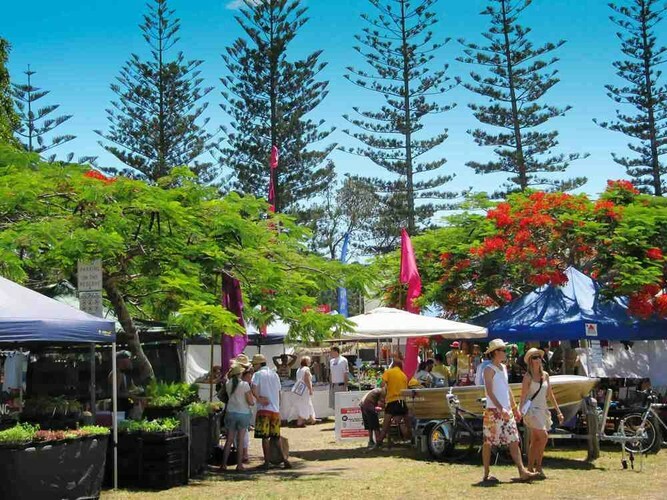 The Brunswick Heads Markets make the perfect start to the weekend and the month! You can find the Brunswick Heads Markets filling up the Memorial Park in Brunswick Heads. Parking is free of charge throughout the town, and the park itself is easily reachable by walking from the town centre.. After enjoying the markets why not take a stroll through the town, offering laid-back cafes like Fleet at Brunswick, and unique shops that are well-worth browsing. And don’t forget to visit the Brunswick beachfront – the perfect way to unwind with family and friends for the rest of your Saturday. During your family holiday in Tweed Heads with The Beach Cabarita, you can visit the Brunswick Heads Markets within just a short drive from our Tweed Coast accommodation. We provide the perfect getaway near Coolangatta Beach for families and groups, with superb onsite resort facilities to make your stay perfect.